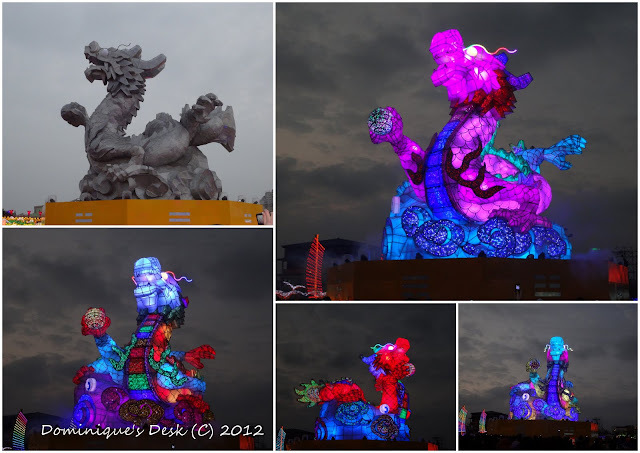 Last week while we were at the Lukang Lantern Festival in Taiwan I saw lots of dragons. Being the Year of the Dragon this mystical creature was really in it’s element and the main feature at the lantern festival. Here are some shots of the Dragon which I managed to take on my camera. The same orange dragon lit up along the main road. A dragon made of pink pinwheels. It was really impressive seeing all the pinwheels moving due to the strong wind. Another hanging orange dragon. This one has money in it’s claws. The “Mama of all dragons”- central attraction which is lit up before the evening program commences. Oh, I love the orange one all lit up, and the pink pinwheel one! wow so many different kinds! you captured them very well..
Oh gosh, what an experience this must’ve been. Your pictures are absolutely stunning. The mama of all dragons — wow! I really like the pinwheel one…..wish we could see the movement; sure it was lovely!!! I’d love to see that all in person!!! Thanks for sharing. I love those dragon pictures! Very colorful! I wish I would have seen this in person. Yeah! the year of the dragon! Wow! You have some excellent photos. The dragons are wonderful. Great colors! Love the photos! So impressive…I can only imagine how awesome it was to see in person! Fab pictures Dominique! Thank you for linking up! What amazing dragons! Each is so unique and different. Wow, those dragons look even more amazing than the ones I saw in Las Vegas! !